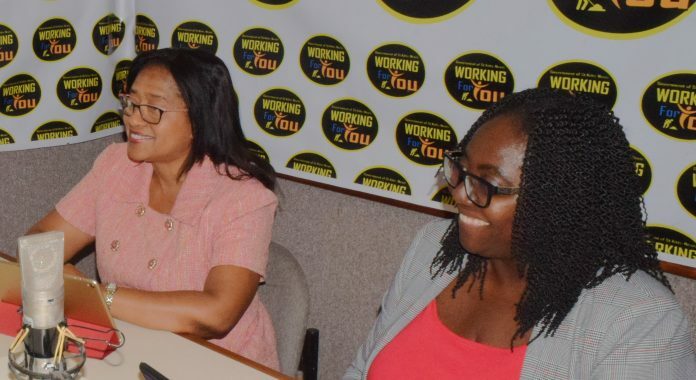 Dr. Hazel Laws, Chief Medical Officer (left) and Dr. Marissa Carty, NCDs Programme Coordinator in the Health Promotion and Advocacy Unit at the Ministry of Health. Basseterre, St. Kitts – A new non-communicable disease (NCD) action plan to help combat the prevalence of these maladies in the Federation is being developed by the Ministry of Health. The plan is currently being edited and then will go before the Cabinet for approval, according to Chief Medical Officer Dr. Hazel Laws. “This new action plan is going to provide us the roadmap to guide our activities and interventions as we move forward,” Dr. Laws said. “The plan is from 2018 to 2022. It’s a number of interventions that are going to help to decrease the burden of NCDs. Dr. Laws said several questions have arisen while designing the policy including whether smoking tobacco will be allowed in public places and implementing taxes that may result in decreasing the demand for tobacco. “With this policy, we are collaborating with the Attorney General in developing an appropriate tobacco policy for the Federation,” the Chief Medical Officer said. The tobacco industry is marketing more electronic nicotine delivery systems to appeal to young people, according to Dr. Marissa Carty, NCDs Programme Coordinator in the Health Promotion and Advocacy Unit at the Ministry of Health. “Young people tend to go to these as opposed to the cigarettes,” Dr. Carty said. “Research on electronic cigarettes has not been extensive, but some research shows that these products can be used as a gateway to either smoking tobacco or marijuana. “These are some of the things we have to look at when in developing our tobacco policy and especially if we want to safeguard our young people,” Dr. Carty concluded.